The Brisbane central station upgrade is expected to be completed in three years. Image courtesy of PDT Architects. The station will have a new roof that will cover the Edward Street end of the concourse with a glass facade. Image courtesy of PDT Architects. The redesign and refurbishment of back-of-house facilities at the station commenced in September 2016. Image courtesy of PDT Architects. Two existing escalators at the station will be refurbished as part of the upgrade. Image courtesy of PDT Architects. A new escalator will be installed at the Edward Street end of the upper concourse to connect station with ANZAC Square. Image courtesy of PDT Architects. It is the busiest station in the South East Queensland network, with more than 5,000 trains a week passing through the station on two main lines and four suburban lines. The station is used by more than 140,000 commuters a day. The station upgrade project was initiated in September 2016 with an objective to revitalise and modernise infrastructure to improve customer experiences and cater to growing passenger needs. It is estimated to be completed with an investment of $67m and will create employment for 750 people during the construction phase. The Brisbane central railway station was initially opened in 1899 with a timber and galvanised iron structure, and two passenger platforms. The central building, which is listed as a state heritage, was completed in 1901. The station was renovated with the expansion of the subway from Ann St to Anzac Square between 1930 and 1931. The vaulted roof over the station was removed and replaced with awnings over each platform in 1963. Construction of office towers over platforms at the Edward Street end of the station and the modern pedestrian retail concourse located behind the station building were completed between 1968 and 1970. Construction of a hotel over the centre of the station was completed in 1980s, and platforms five and six were opened in 1996. The station did not undergo any major renovation after 1996. The station upgrade project will involve the construction of a new roof and glass façade, which will provide light and improved ventilation to the Edward Street end of the concourse. Platforms, ceilings, walls and floors will be renovated, and CCTV and lighting will be installed. Platforms 2/3 and 3/4 will be upgraded with extended cover and information display screens, while platforms one to four will be raised to allow level-entry boarding, which will help passengers in wheelchairs and those travelling with luggage. "Construction on the station modernisation and upgrade project began in September 2016, and is expected to be completed by 2019." 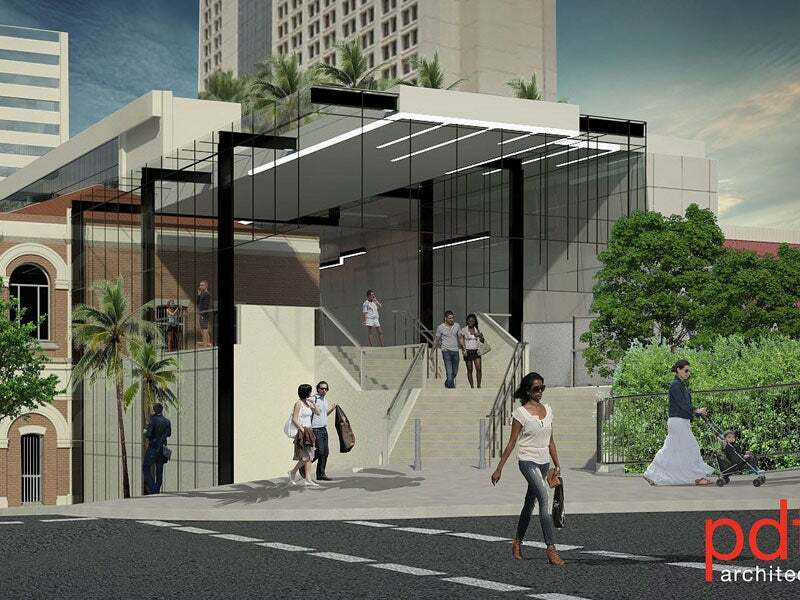 An escalator will be added to connect the station with ANZAC Square, while the escalators, stairs and lifts leading to platforms will be renovated. The project will also refurbish station facilities, including communications rooms, first aid areas and offices. Construction on the station modernisation and upgrade project began in September 2016, and is expected to be completed by 2019. New lift, escalator and platform upgrades will commence in early 2017. Early investigative works on the upper concourse and platforms will be completed before March 2017, before the Commonwealth Games in April. The central station will remain open during the construction, with most of the upgrade works taking place at night and on weekends to minimise disruption to passengers. The design contract for the station upgrade project was awarded to PDT Architects.